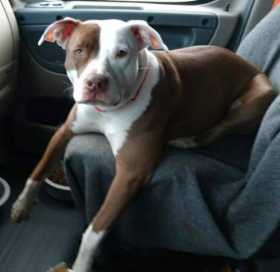 Mia ...a 2 yr old spayed, microchipped female pit bull with terrific TEMPERAMENT was stolen from the fenced yard at Super 8 hotel in Stapleton Co at 8am on 1/27/2019. My son is devastated. Reward for safe return. No scammers. Police & animal control notified. Please copy & share on Facebook & everywhere possible as we are out of State trying to search h from a distance. She was travelling with my sons Father when she was stolen from Super 8 motel Stapleton from fenced yard in minutes.